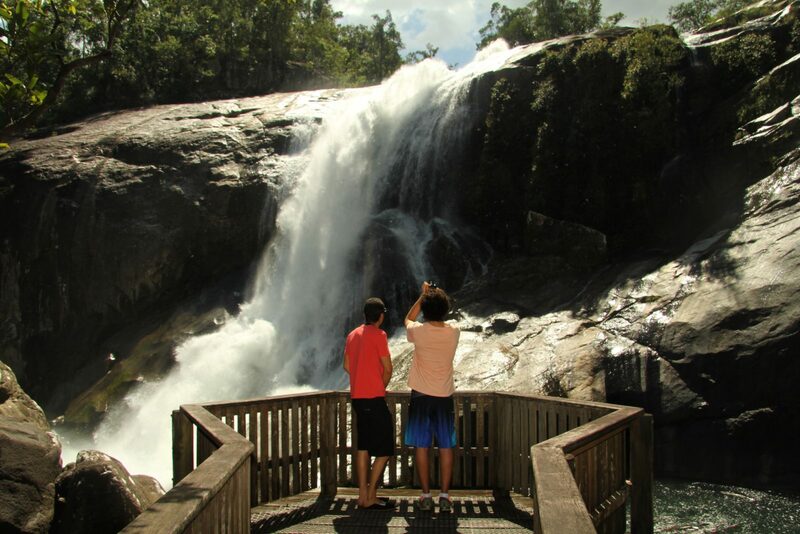 Murray Falls, within Girramay National Park, is one of north Queensland’s prettiest waterfalls, with large volumes of water racing over naturally sculpted granite boulders. Rainforested mountains and tropical lowlands meet in the attractive foothills of the Kirrama Range. The clear waters of the Murray River cascade over boulders into rock pools in this picturesque spot, within the Wet Tropics World Heritage Area. Enjoy a picnic in the grassy and shaded day-use area by the river. Stroll along the boardwalk to a viewing platform near the falls. 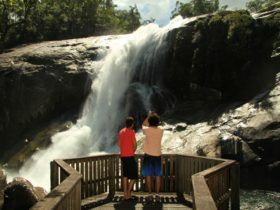 For the more adventurous, take moderately graded 1.8 kilometre return walk through a cool rainforest gully, and then up into open forest and spectacular views over the falls and Murray Valley. Look for wallabies, possums and a variety of reptiles. Bring binoculars and watch for many colourful birds. Enjoy colourful wildflower displays in spring. Access the river from the day-use area but take care as the water is often fast flowing and the rocks slippery, however access to the river upstream of the day-use area is not permitted. Slippery rocks make it dangerous and serious injuries have occurred.